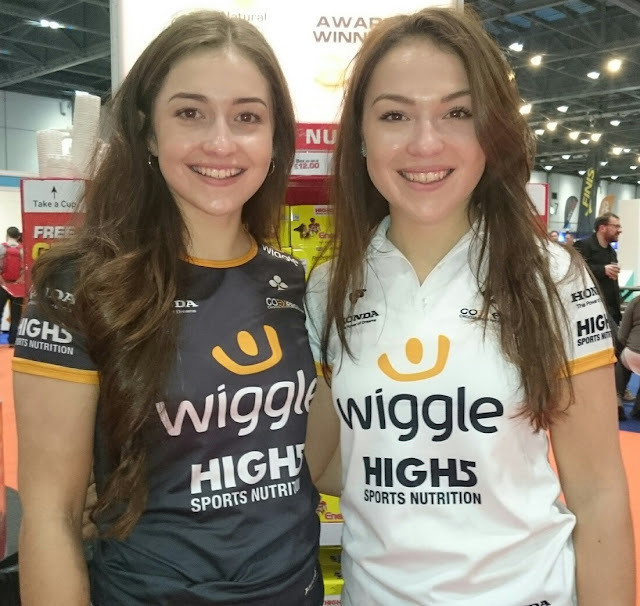 At the recent London Bike Show I caught up with sisters, Grace and Lucy Garner, professional cycle racers in the Wiggle High5 Pro Cycling team. They talked about how cycling has always been part of their lives. Lucy talks about her instinct to look out for her younger sister, while Grace talks about why she doesn't always want to share a room with her older sister! Lucy: I got into cycling very young as it was in our family. My dad has always liked cycling. He used to cycle to work and he did a bit of mountain biking, but my grandparents actually raced – both of them did time trialling. So I started cycling first and straight away I was really keen on doing it, and then my younger sister, Grace started. She wasn’t as keen at first, and sometimes I had to pull her along to join me on the bike rides. Then over the months and years she got more interested and wanted to carry it on and make it a career, so it has worked out really well for both of us, particularly as it is nice to have someone to train with. It works for us, as we are sisters and also friends so if either of us needs someone to speak to, and it’s something that’s not to do with cycling for instance then it’s nice to have someone as close as your sister on the same team. But then like all sisters we have our moments. Sometimes when we are going to a race or training camp Grace will say “I don’t want to share a room with you,” and I’m like “Oh, thanks Grace!” Yeah, sisters sometimes fight – we haven’t been in that situation this year, but I am sure it will happen at some point! Grace: Sometimes I don’t want to share a room with Lucy. We are just too close at times! When you are just team mates you are always nice to each other, but with the added element of sisters there can be too much honesty between us! Lucy: It's good that we are on the same team now, rather than before when were racing against each other. There’s no sibling rivalry anymore, so one day I can work for Grace and another day she works for me. So it kinda works out pretty well. We had moments last year when we were in the same race but riding for different teams, particularly as Grace joined in some seniors races. It was nice to see her in the race, but if I saw a big crash I would get worried and wonder if she was in it. Even though we were on different teams I would feel like I had to look out for her, being her older sister, and it was hard because I would have wanted to stop and help her, even though I was racing for a different team. Thankfully Grace got on very well in the races. She does know what she is doing! Grace: Cycling is our lives. It’s all we’ve ever done since we were children, so we’ve grown up in a cycling family. We would regularly go out on bike rides together. On family holidays we’d always take our bikes and cycle in the area. I did mountain bike races when I was young, though it was more for fun. A few times when they did the Inter-regional Championships and they were short of a rider I stood in. My cycling career just continued to develop and here I am now racing for Wiggle High5! Lucy: This is my fifth year as a professional cycle racer, though it feels like I’ve been doing it for years! I won the Junior World Road Race Championships in 2011 and 2012, and they've definitely been the highlight of my career so far. It was pretty surreal when I took the Junior World Championship title for the first time. I had trained so hard for it, but I wasn’t sure how I was going to do on the day. Amy [Roberts, Wiggle High5 team-mate] was with me and we just said we would do our best, so it was amazing to get the win. My life changed overnight, particularly as suddenly I was getting talked about in the media. It was really special and a privilege to wear the rainbow jersey. I’m gonna be honest and say that the transition from junior to senior racing was hard. It was really tough. After I got the first year out of the way and I joined in a team – initially a Dutch team [Liv Plantur] where I learned a lot from the older riders – I got used to it and things are going really well now. The hardest race I’ve ever done is the women’s Giro d’Italia – the Giro Rosa. I’m not very good at climbing and there was a lot of climbing there so I suffered a lot during the races – hopefully it has made me stronger. Italy is beautiful but it is very tough riding over there! When things get tough in those stage races you almost have to zone out for the whole 8-10 days. You just eat, sleep and race and then repeat it the following day. It’s just constantly like that. You just get into a rhythm and make sure you’re eating, sleeping, and resting enough, and you just have to get through it! 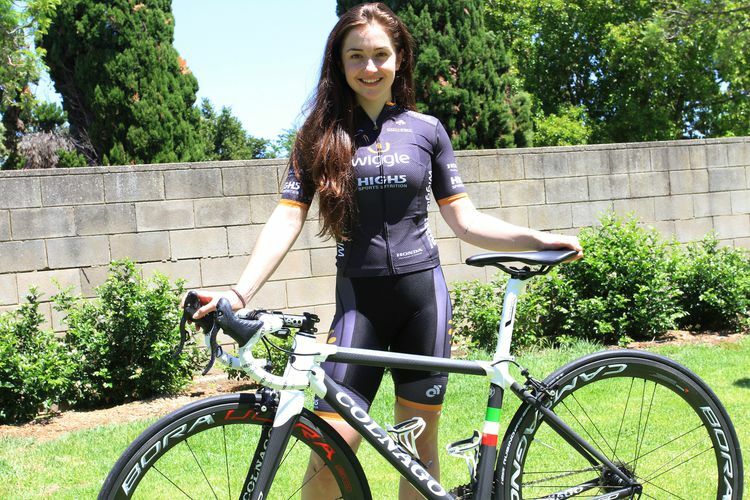 Grace: I am very happy to be racing for Wiggle High5, and knowing that Lucy is on the team and has been in it for a year has not made it as daunting as it could have been, riding alongside people like Giorgia Bronzini or Annette Edmondson. I wasn’t so scared about going to Australia for the Santos Women’s Tour Down Under and Cadel Evans Ocean Race, as I knew Amy (Roberts) as well and I had spoken with all the Wiggle High5 staff beforehand as well, so I felt that it was a smooth transition. I met Rochelle [Gilmore] in Australia and she’s been very supportive. She’s got so much experience. Lucy: Last year was my first year in Wiggle High5. It’s really nice to be back in a British team. You feel more at home. I live in Holland and I’ve been there for four years so it’s nice to come back. I really like how professional the team is and how much they want to progress women’s cycling. It is a British team but we don’t have a specific base, so everyone comes together in Belgium a few times a year. Also the riders are from all over the world – Japan, Italy, UK, Sweden, everywhere. It’s a very international group of girls. We all have very different characters too. For instance, Giorgia Bronzini is the team joker, and is a really nice woman. She has been world champion in the seniors, and she’s got so much experience behind her, but she’s really down to earth and it’s really good for her to be in the team. Giorgia is the one I look to for advice. She’s always there if you need her and is open to helping the younger girls in the team as well. I’m not just saying it because I am on the team, but the bunch of girls we have are so nice, and we all get on really well. We will be in Belgium racing together for 10 days, but we will also have a good time off the bike. That’s why I really like being on the team. Grace: I’m not yet sure of my capabilities within the team and it’s a completely new environment for me to be a team member. Obviously last year I was in Podium Ambition. It was good fun but we were all less experienced riders, whereas being in Wiggle High5, which has a few multiple World Champion medallists and Olympians, is crazy for me. I just want to find my place and do as much as I can for the team. Lucy: One of the main reasons why I like cycling so much is that it is such a social sport as well. You can see a lot of places by bike. When I was younger we used to go with friends and family on a tour around Assen, Holland, biking and camping. I really enjoyed those trips. Otherwise, when at home you can go out on long training rides for four hours, or you can just go with a group and socialise with others, which is nice. I would like to do another season of cyclocross at some point, as I did it for eight years as a junior. I still do it in the winter and, being with my partner, Lars [van der Haar], who is a cyclocross rider, HHaI train a bit with him. So it would be nice to do another season of cyclocross. Lars and I met after we started speaking over Facebook and he came to watch a few of my races because I was racing a lot in Holland. Our relationship developed quickly from then, and we’ve been together for nearly five years now. Living together we can understand what the other person is going through – though he is doing a muddier version of what I do! Sometimes I think it would be nicer if we had the same season. For instance I’m in my off-season while he’s in his season and that makes it quite hard if we want to go on holiday together and things like that. But we have a system that works and it’s nice. Sometimes we are away from each other for quite long periods of time, but we are used to it now. With us both being bike racers we can support each other, particularly during those difficult times. Lars has had a hard cyclocross season this year as he has struggled with injury. He did well at the World Championships this year, finishing fourth. That was a good result considering the problems he'd had. I give him as much support as I can, though I don’t pit for him. I am never doing that! I prefer to cheer him on from the sidelines! Grace: I enjoy all types of cycling, though I would like to do more track. I really would, but it is just hard to fit everything in, and it is harder to do if you are not part of the British Cycling track programme. Cyclocross is fun to do here and there, but I would like to do a bit more track. We are based in South Leicestershire and we’ve got access to a lot of nice roads. We are lucky to make it a flat ride or a hard ride, so there’s quite a mixture. The terrain we ride on, around Rutland and North Leicestershire is quite undulating. It’s not as hard as say, Yorkshire, where you are going up and down all day, but it is still quite testing. We don’t live in a town, so we can get out onto nice lanes straight away and we see a lot of other cyclists on those roads. Yesterday there were quite a lot of people out even though the weather was horrible. We joined on the back of a few club runs, dressed in our team kit. The riders recognised us but didn’t dare to try and drop us. It was quite fun! Lucy: My favourite place to cycle…Well in Holland it’s all pretty much the same as it’s just flat! I like training in Holland, but I like coming back to the UK and riding my bike with Grace as she always makes up some good laps on her Garmin when we go on rides together. My ideal place to ride a bike would be somewhere warm, though not too warm like Australia. Grace: My ideal place to cycle would be Gran Canaria where the sun shines most of the time. I like cycling in Leicestershire but it’s just not that sunny! Whenever I ride I never go out without a banana. I always like to have a banana with me when I go out just in case you get that unexpected drop in energy. Lucy: I never go out without my Garmin. I just like knowing how long I have been out and how many Watts I’m doing. I don’t like riding without knowing how I’m doing. My advice to anyone wanting to get into professional cycle racing is to be patient and believe it will come. Just see it as fun and don’t get so serious, particularly when you are young. Do lots of different things. For me, bike riding is sociable and fun. I’ve met so many interesting people through cycling, so I would say just enjoy it.